Natural Immunity: Practical Ways to Enhance Health. Emily Kane, N.D.,discusses an array of ways to enhance natural immunity through the basics of rest and work balanced by play and foods for an optimally healthy diet. A Nutritional Solution to AIDS & Other Viral Pandemics. Harold D. Foster, Ph.D.,writes that major geographical patterns of infection are becoming obvious. Is there a connection between the patterns of AIDS infection and the dietary selenium intake? The author makes a direct connection between selenium consumption, three amino acids, and reversal of AIDS. 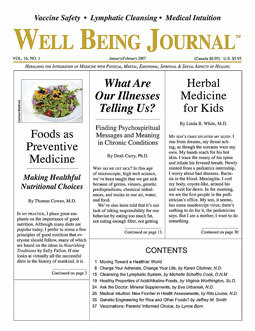 Michelle Schoffro Cook, D.N.M.,shows how fresh fruits and vegetables can be some of the most potent natural medicines. The overall health results of making a few changes to the how, when, and what you eat will seem simple but are profoundly effective. Scott Miners writes that much U.S. and global farmland is depleted of selenium, yet selenium plays a pivotal role in immunity to cancer and many other potential illnesses. Mark Sircus, Ac. O.M.D., states that magnesium is essential for calcium absorption as well as digestive processes. Learn about its health effects on many parts of the body and the best form to supplement with. Ask the Doctor: Magnesium Supplements. Eva Urbaniak, N.D., says that athough there are many forms of magnesium used for nutritional supplementation, all forms of magnesium are alkaline and have a relaxing effect on the human body. Faith Healing, Placebo Effects, and Imagery. Martin L. Rossman, M.D., discusses the placebo effect and how it is responsible for over half of the action of some of our most powerful and trusted drugs. Often a shot of placebo solution relieves pain as effectively as if it had been morphine. Pilates: Fitness for All Ages. Meg Charendoff discusses how one of the best forms of fitness and core strength training, Pilates also focuses on the connection between mind and body and offers meditative benefits. Use of CoQ10 to Treat Malignancies. James Howenstine, M.D., writes about how coenzyme Q10 has been successfully used as treatment for malignancies and heart failure. Howenstine claims the lack of interest in CoQ10 by the pharmaceutical companies as a cancer therapy is based on their inability to patent it. Ron Hoggan, Ed.D., states that grains impact our ability to focus, comprehend, remember, predict and survive. Research is now revealing that cereal grains, along with other allergenic and highly glycemic foods pose a serious threat to a sustained ability to learn. Michael Wayne, Ph.D. L.Ac., shows the possibility of consciousness playing a role in the workings of the universe is something that the early quantum physicists considered, however, consciousness affects more than most think. Scott Miners discusses ways to prepare for your future, so that at the end of the day, you don’t feel let down. FDA Approves Virus Spray for Deli Foods • The Seas Turning Red • No On Forced Drugging • U.S. Database of Medical Information • Big Business Creates Pressure to Vaccinate? • Illicit or Legal Drug Problem? • Gene Altered Crops in Hawaii • Artificial Splenda Sweetener Safe?